Cherokee County Extension is starting a new program for market growers in the county and surrounding areas. The Farm Show and Tell series will take place at a farm to showcase the various operations and give our growers a chance to share what they are doing with others. 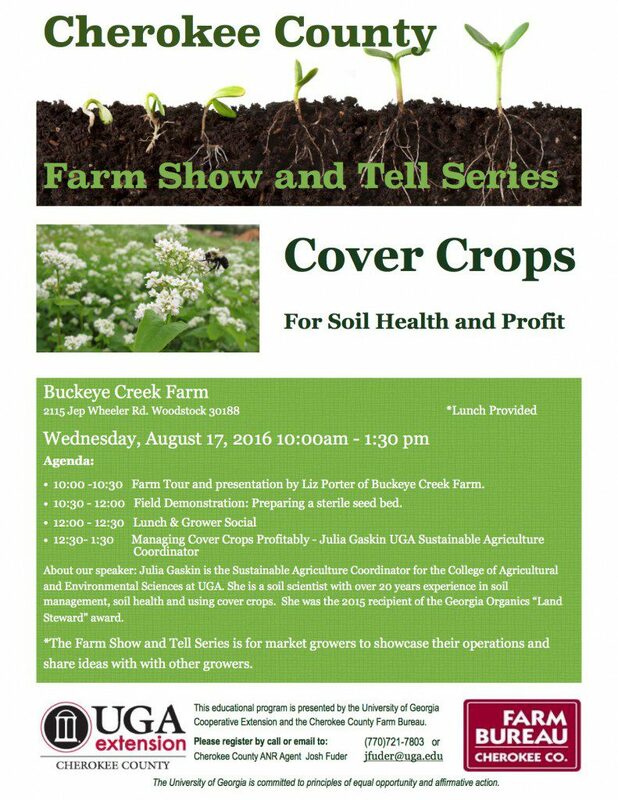 Each meeting will also have a topic relevant to growing for market, with this first meeting being cover crops. Many thanks to Farm Bureau for sponsoring the meetings! Please share the program with you local grower and give us a call if you plan to come! Posted in Cherokee County, cover crops, Farm stand, Farmers Markets, growers, local business, Soil. This entry was tagged cover crops, farm, Farm Bureau, farm show and tell, Soil, soil health, UGA Extension. Bookmark the permalink. Next: Buckeye Creek Farm in the news! !